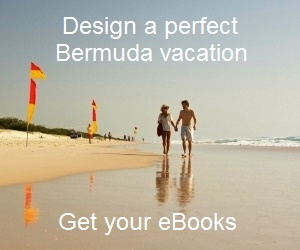 This is some real novel way of touring Bermuda's great sightseeing places. Segway Tours offers two-wheeler hi-tech machines that are self balancing. All you need to do is just ride. They call these machines Segway Human Transporters. This revolutionary machine is environmentally friendly, self balancing, fun and easy to ride. In fact this advanced machine is the only vehicle permitted inside the Royal Naval Dockyard (kings Wharf). Otherwise, if you want to go around the dockyard, you need to walk or take the train trolley. Since this machine has carrying capacity limits, all riders need to be a minimum of 100 lbs. and a maximum weight of 260 lbs. The tours begin with safety instructions. It includes an introductory video and thorough training session. With your wireless headset, you will be able to clearly hear insightful historical facts throughout your tour. You will be gliding effortlessly through the Dockyard, enjoying ocean views and exploring historical sites along the way. Some of the sites that you will see inside the dockyard includes the Clocktower Mall, historic Casemates Prison, Victualling Yard, the Glassblowing and Rumcake Factory, Historic Sail Loft and a lot more. 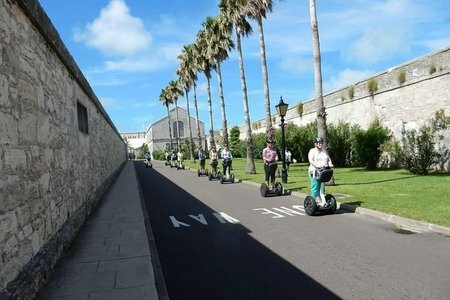 Segway is the only vehicle allowed to tour the Bermuda Maritime Museum and the Commissioner's House. From the Commissioner's House, you will be able to view the Defense Heritage Exhibit, which shows a history of weaponry and military in Bermuda. Tour Timings: 10am - 12noon; 2pm - 4pm. Cost: $75 per person. The tour includes brief safety orientation training. You will zip through narrow alleyways and enjoy scenic areas. Along the way you will visit the historical sites of the unfinished church, Fort St. Catherines, Tobacco Bay and learn fascinating facts about the East End of the island. Royal Naval Dockyard, Somerset, Sandys, Bermuda. 1) Bermuda Bus Tours: Know about other great tours on road.